Among several supporting modules for Magento merchants, Gift Card extension seems to be the most necessary and updated choice since the emerging of card giving trend among people. One of the most attractive features of this extension is its appearance. Magento 2 Gift Card by Mageplaza is equipped with a bundle of beautiful templates and eye-catching designs which provide customers chance to choose the preferred products. In default setting of this extension, there are numerous themes available that can meet buyers’ demands on different occasions such as Thanksgiving Day, Christmas, New Year, Black Friday, and so on. Besides, each theme consists of various beautifully-designed images with aim to meet every customer’s tastes and preferences. Furthermore, if shopping doers find no image matching their interest, they can upload their own images and use it as a typical design. By doing so, store owners are sure to have more satisfied buyers, consequently, create customer retention for their businesses. Although Gift Card extension provides several themes and images suggested for store owners, they can yourself generate more themes and pictures to enhance the diversity for their vouchers. To start configure this field in management system, first admins have to navigate Admin Panel > Mageplaza > Manage Templates. Now, let’s begin with Template Information. 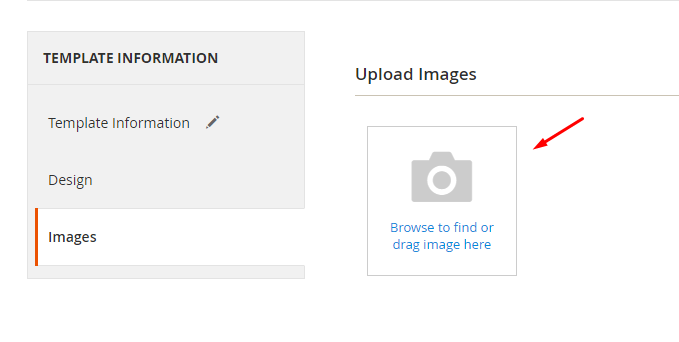 In this page, remember to fill in Template Name, enable this template to be used by select Active in Status option, and choose Yes in Allow Upload Image so that customers can apply their own images. After that, store admins can personalize other fields. For example, name the Gift Card Title, choose Font Family, and Background Image. In the Gift Card Note, admins can notify buyers about terms and policy of a valid card to avoid argument in the future. Finally, do not forget to click on Save button to save your configuration. In Template Design, before configuring, users should choose a template to apply this design. 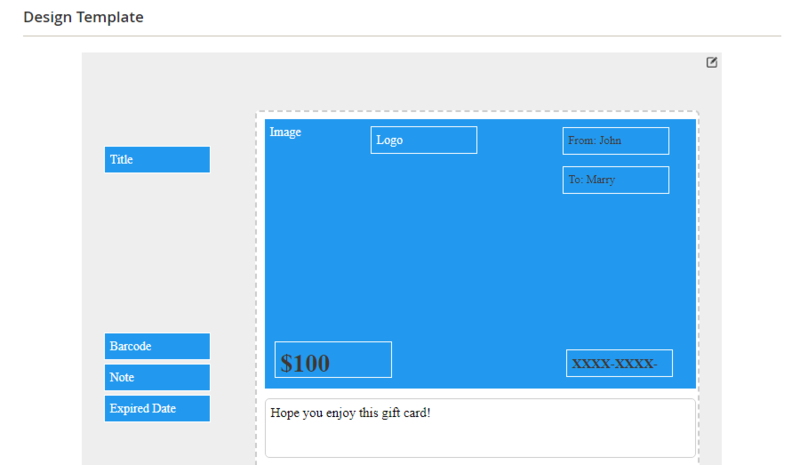 After that, you can easily design template for your own store by simple actions like drag and drop the fields. Among a bundle of fields provided, you can choose which one will be presented on the card and also where to put it. Once you finish setting up, remember to choose Save option right on the top of the page. Furthermore, store owners are also enabled to upload their own images by clicking on Images and then browsing or dragging pictures to this page. The last step is also to click on Save button so that the system can update new changes. With Magento 2 Gift Card extension, consumers have the right to generate their own gift vouchers which can match their preferences. Normally, buyers purchase a gift voucher to others on specific occasions such as New Year, Mother’s day, Halloween, and so on. Once they define the theme of the certificate, they can click on a picture to start personalize their card. 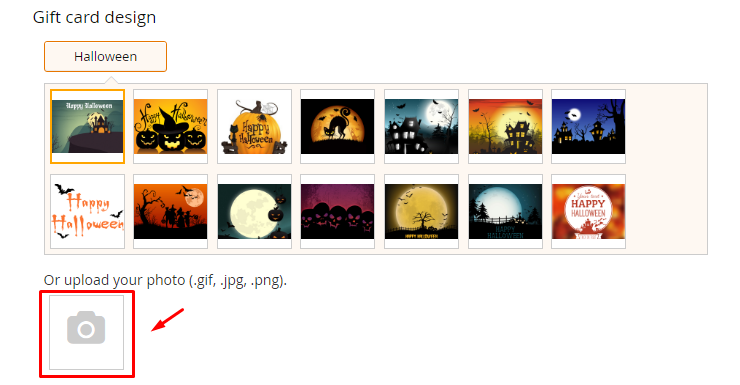 In this page, buyers are provided with a bundle of beautiful pictures that match the theme chosen. Customers can select one image among them as a theme for their card; otherwise, they can upload their own images from their devices to use. After that, purchasers are asked to fill in required information such as amount of money valid, sender information, and recipient information. 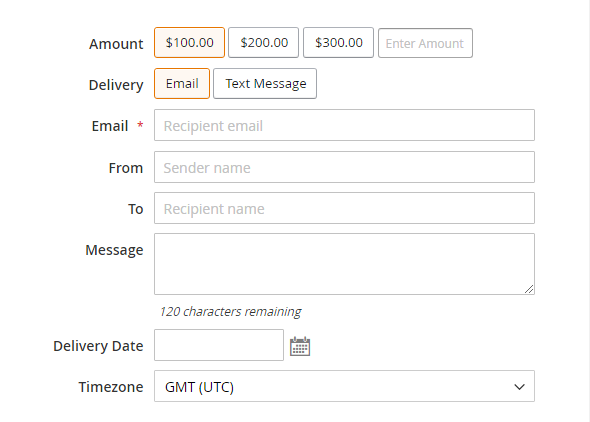 Based on the delivery method chosen, customers have to add appropriate information like sender or recipient name and address. Besides, shoppers can attach a text message along with the purchased card so as to make the gift more meaningful and memorable.